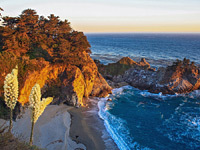 The highlight of Julia Pfeiffer Burns State Park is undoubtedly beautiful McWay Falls, one of only two coastal waterfalls in California, where McWay Creek falls 80 feet over a granite cliff onto a sandy beach, or at high tide directly into the Pacific Ocean. 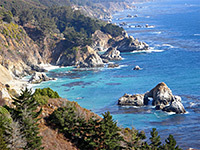 But the 3,762 acre park also contains several more miles of high, rocky coastline, the grassy bluffs either side of Highway 1, an undersea area popular for scuba diving, and a section of the inland hills rising almost to 3,000 feet, mostly covered by mixed woodland of chaparral, oak and redwood. Like Andrew Molera, 15 miles north, the park commemorates an early twentieth century pioneer of this remote region. Julia Pfeiffer was born in 1868 and moved to the Big Sur coast with her parents one year later, when the family built a cattle ranch and farmed vegetables. Julia married quite late in life (1915) to John Burns, and afterwards settled near present-day Burns Creek, a few miles south of McWay Creek. 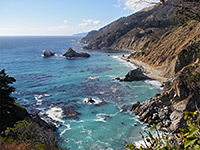 She still was a rancher but also operated a guest house a little way further north along the coast, a site now occupied by the Esalen Institute, and became well known to tourists and the other local residents. Julia died in 1928, having in her later years become close friends with one of the main landowners in the region, Helen Hooper Brown (wife of congressman Lathrop Brown). So impressed was Helen with Julia's life and achievements that she donated all her land to the state of California on condition that it would be named after the pioneer woman. The center of the state park is at McWay Creek, where a short side track leads to a small parking area in woods beside the stream - a place that often fills up by mid morning and has no room for large vehicles at any time. A $8 day use fee is charged, but like other Big Sur parks, parking is free (and fine for oversized vehicles) alongside Highway 1, the nearest suitable layby here being 0.2 miles further south. 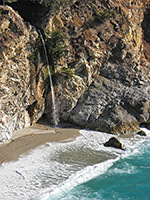 Two trails start from the official carpark, the main one following the creek seawards, passing under the road in a concrete tunnel then leading south along the top of the cliffs to a view of McWay Falls and its pristine sandy beach, both about 200 feet below. 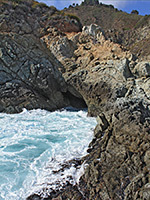 The cove is exceptionally pretty, containing brilliant turquoise blue water, clean whitish sand, jagged rocks and rough, white-topped waves. Climbing down is forbidden, to protect the environment, and there is no path to the shore, though a descent down an overgrown slope just north of the falls looks relatively easy,. The overlook trail ends at the ruins of a ranch (Waterfall House) built by the Brown family in the 1930s - this was quite a grand, two-floor structure that included terraced gardens, a mini-railway and several outbuildings but all was destroyed in 1965, as requested in Helen's will, so that the coast could be returned to a more natural state. What remains are various foundations and many large, non-native palm trees. Again exploration of the site is not officially permitted, but quite easy if desired. In early and late winter the overlook is also a good vantage point to spot whales, on their migration route to and from warmer waters around Baja California. Seals and sea lions may often be glimpsed as well. The other path heads up the creek into the forest, and soon branches; the Canyon Trail follows a wooded ravine, reaching another waterfall and some old-growth redwood trees, while the longer Ewoldsen Trail ascends into the hills, also passing some redwoods though for most of the time traversing open slopes with views of the ocean. The carpark is also one of the places to leave vehicles if camping at the park, though the site is for walk-in guests only - the 'environmental' campground is hidden in a cypress grove on the far side of the road, close to the edge of the cliffs. Capacity is meant to be just 2 groups of up to 8 people each, and the place has limited facilities but is popular because of the peaceful location. Walking 20 feet through the bushes reaches several sheltered overlooks directly on the edge of the cliffs, and 200 feet above the ocean, so perfect places for watching the sun set over the Pacific. The site is also accessed by a shorter trail starting 0.2 miles further south on Highway 1, at the same layby used for overflow parking. 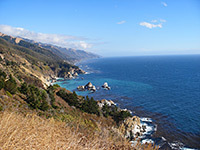 The second most visited area in Julia Pfeiffer Burns State Park is Partington Point, where several short paths wind around a grassy promontory for good views up and down the coast, and the Tanbark Trail climbs far into the mountains, though even from the highway the views are quite spectacular as in this southern part of Big Sur the road is generally quite high above the ocean, enough to see the sheer coastal cliffs for many miles, and a long way west over the Pacific. 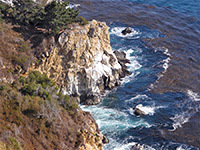 The closest towns with hotels near Andrew Molera State Park are, to the north: Carmel (37 miles) and Monterey (41 miles), or to the south; San Simeon (55 miles) and Cambria (61 miles).